Field of Mars was originally intended to function as a 'battle board' for the Lace Wars™ series, which is 'operational' in scope and normally resolves battles using a combat results table. To add value to the product, Field of Mars has been designed to function as a complete game in its own right, suitable for playing both random and historical battles devised by the players. No knowledge of the Lace Wars rules is required. (Caveat: the game does not include any historical scenarios.) With some modification it could also be used to play battles generated by different game systems. The game uses a gridded mat and terrain tiles to create a wide variety of battlefields. The players' forces are deployed on this mat in stacks of counters called 'wings'; the wings are the 'manoeuvre unit' in this system. The players issue orders to their wings by rolling dice and distributing them among their wings. The more pips a die has showing, the greater the number of tactical choices its wing has. Once orders have been issued, a series of discrete steps is followed, each permitting the execution of one particular kind of action (for example: Advance, Fire, Assault). In each step the players decide whether any eligible wings (those with the correct die value) will execute that action. The object of the game is to render opposing wings hors de combat. In the context of the game this means the wing is removed from play. This is accomplished through artillery and musket fire, cavalry charges, and infantry assaults. The first side to go over the required number of hors de combat wings loses the battle. 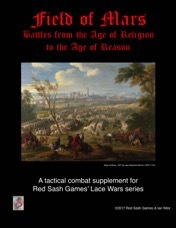 The rules include instructions for creating random battles using the counters provided and also instructions on how to use the game to fight battles generated within the Lace Wars system. 1) One large play mat, called the Battefield. 2) 360 die cut counters representing various generic forces, plus markers. Scale is variable. 3) 60 terrain tiles (boxed version only; for Print and Play see above). 4) Rules, charts, and tables. If you buy the Print & Play version of Field of Mars there is an extra hoop you have to jump through. The terrain tiles used to vary the play area are produced by a third party: DriveThru Cards. You have the option of ordering a physical deck from them at a cost of $8.40 USD plus shipping, or downloading a free PDF. Go to DriveThru Cards and search for Red Sash Games or Field of Mars.